The Crystal Beach sea cave (called the “Cave of Waves” in the postcard) is a pretty tricky place to get to, but it’s well worth the time and trouble. 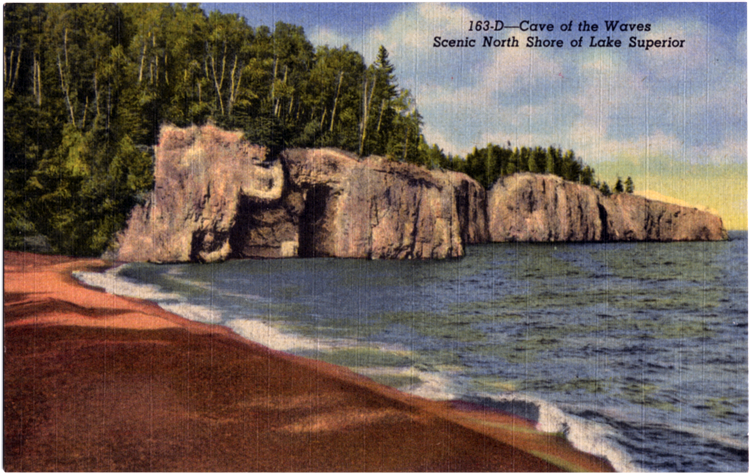 Found near milepost 60 on Highway 61, the cave—more of an arch, really—is one of the largest on Lake Superior, carved from the rock by the lake’s relentless waves. You can’t get in the cave from the beach without a kayak or canoe, but you can see it fairly close up. It lies to the east of a horseshoe-shaped beach surrounded by cliffs where Crystal Creek empties into Lake Superior. Ruins of abandoned structures indicate that this area was once the birthplace of Minnesota Mining and Manufacturing, better known today as 3M, one of the largest companies in the world. In 1902 Two Harbors attorney John Dwan and a few of his friends organized the company, intending to set up a mining operation along the shore at Crystal Bay near the Baptism River to extract corundum, an abrasive used in grinding wheels—it would have been one of only two such operations in North America. Unfortunately, the mineral they mined at Crystal Bay was not corundum but anorthosite, a much less valuable product. The company nearly collapsed before St. Paul’s Lucius P. Ordway bailed them out. They set up a sandpaper factory in an old Duluth flour mill, but the inferiority of the anorthosite and Duluth’s humidity almost crushed them again. Ordway then moved the company to St. Paul where it thrived—and continues to do so. By the way, some folks from the Silver Bay area call this spot “Peterson’s Beach,” and it was once a popular spot to enjoy a fire with friends.